The history of Vicarage Road is almost like the plot of a film; ups and downs, excitement and disappointment, failure and redemption. It is located in Hertfordshire and first opened its gates on 30th August 1922. It has been the home of Watford FC since 1922, but was also briefly called home by Wealdstone FC (1991-93) and rugby union side Saracens (1997-2013). We have information on the history of a number of other football stadiums too, including the history of the Etihad Stadium, so make certain to look around our site for more information. 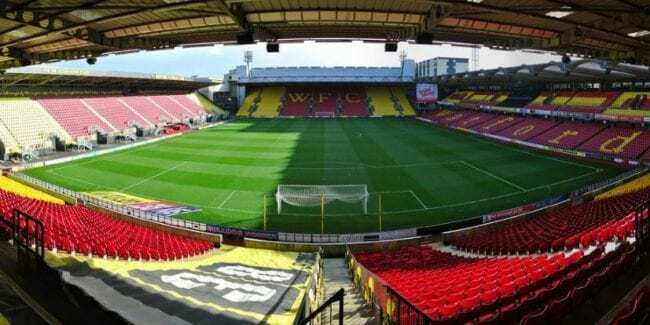 ‘The Hornets’ have seen Vicarage Road change drastically over years, and in its current configuration has a capacity of 23,700 with more seats being added all the time. This is nowhere near as big as The New Wembley Stadium, which has a huge capacity! Watford FC were formed in 1881 and were originally known as Watford Rovers. They take on a number of football clubs in various matches each year. If you wish to place a bet on one of their matches, make sure you click here. The first team consisted mainly of amateur player, but they did compete in the FA Cup in the 1886-87 season, before winning the County Cup in 1889. After having no fixed home, they moved to a ground at Cassio Road and changed their name to West Hertfordshire in 1893. By 1898, West Hertfordshire merged with local rivals Watford St. Mary’s and changed their name again to Watford Football Club. They played in the Southern Football League until 1920 when they joined the newly formed Football League Division Three. What followed were many years of indifference on the pitch. They held their place in the Third Division until the Football League was suspended due to the outbreak of World War II. After the War the Football League was restructured in 1958 and they were placed in the newly-created Fourth Division. They were promoted in their first year but would remain in the Third Division until 1969. They stayed in the Second Division until 1972 but were relegated, followed by a second relegation in 1975. Our team can offer the best football betting tips, so make sure you have a look before placing any bets. The nickname for the FC is ‘The Hornets’ – so why does the badge have a moose on it? The reason for this is very simple; between 1920 and 1959 the team played in a blue and white colour scheme. They changed to the now familiar yellow and black colour scheme and the club crest was changed in 1974 to include the club’s mascot, Harry the Hornet. In 1978, Watford changed their crest again to that of a hart, a male deer, to represent the town’s location in the country, Hertfordshire. It is not a moose! Despite the change and the hart logo still being used today, ‘The Hornets’ nickname has stuck. In 1976, lifelong supporter Elton John became club chairman with a view to turning The Hornets’ fortunes around. He appointed Graham Taylor as manager in 1977 and this began Watford’s meteoric rise up the footballing ranks. In just five years, Taylor took them from the bottom of the Fourth Division to finishing a close second to Liverpool in the First Division. Graham Taylor left at the end of the 1987 season to manage Aston Villa, but he would return for a second stint as the club’s interim manager in 1996. Unfortunately, his experience could not steer them away from relegation and they would play their next season in Division Two. Taylor then became Director of Football at the club, but dusted off his Managers jacket in 1997 to take charge of the team once again and lead them to two more back-to-back promotions. By the end of the 2001 season, however, they had been relegated again and Graham Taylor retired from managing football. He was named Honorary Life President of the club and The Sir Stanley Rous Stand at Vicarage Road was renamed in his honour in 2014 and he passed away in 2017. Today, Marco Silva is the Watford FC Manager. If you think he is a good manager and you think the team are going to win the next match, you might want to place your bets at the Winner Sports Betting Site. The history of Vicarage Road Stadium owes a lot to the most unlikely of sources – Sir Elton John. Elton rescued the club in the mid-1970’s when the team were on a downwards spiral and languishing in the old Fourth Division. It was his hiring of Graham Taylor that reversed the clubs fortunes and brought them back to life again. He also made considerable financial contributions, including loaning the club £3 million to build a new stand at Vicarage Road Stadium. He sold the club in 1987 to Jack Petchey but remained as the club’s president. If you are happy with the team and want to see a match, you might be interested in checking out some betting sites to place your bets. In 1997 Elton John – Watford Football Club chairman at the time – bought the club back from Petchey and once again become its chairman, before stepping down in 2002. He still owns a significant financial interest in the FC and held a concert at the stadium in 2005 with all the proceeds going towards helping the club to buy back the freehold for the stadium that they had had to sell a few years previously due to financial troubles. In 2015, Vicarage Road’s newest stand was named the Sir Elton John Stand in honour of his extraordinary commitment to the club. Gino Pozzo is the Watford FC chairman today. Find out about the history of other football clubs by visiting our blog page. For the latest Watford FC news, the best place to go to is their official website, although there are numerous online fanzines that are equally as thorough. The Watford Football Club fixtures list is important for any Hornets fan, so they can work out their travel plans for the upcoming season. The official website even has a handy countdown in the corner to tell you how long it is until the next match. You can also find fixtures for other clubs including Liberty Stadium fixtures. Watford football club tickets for games and a tour of the stadium can be found on the official website. 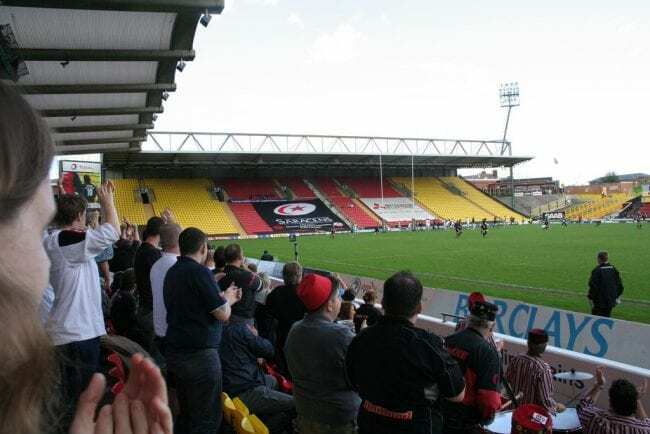 Vicarage Road has been under a lot of development recently expanding its capacity, so it’s best to check with the club to see what tickets are available to avoid disappointment. For details of tickets at other stadiums including the King Power Stadium, please have a look around our website.